History, without the shadows of skepticism, looks dull ! Recently I have read a book written by Sri Sadhu Subrahmanya Sastri (SSS), one the pioneers of TTD Epigraphy. 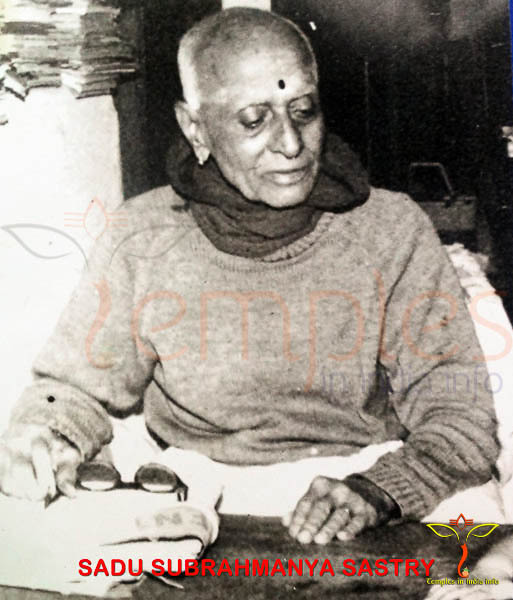 Sri Sastri worked as Peishkar of Tirumala temple and during his tenure he focused his attention on recording the inscriptions of Tirumala temple. Though not a trained epigraphist, he undertook the task of reading, editing & recording of Tirumala inscriptions. As part of this, he underwent training in Madras as well. All history lovers and epigraphic enthusiasts must remember Sri Sastri's contribution in preserving the crucial information related to medieval South India. His relentless efforts in publishing the Tirumala inscriptions shall show the path to the would-be epigraphists. Sri Sastri is one of the many inspirations that made me to take up studying the history on epigrahic evidences. I have picked up some confidence by reading about him that a layman such as me too can venture in to epigraphic studies. As studying the history is a litmus test to what we believe versus what we must understand, at times, we may have to differ from what our elders taught or wrote. With this background I am writing this mini series of articles by bringing up the doubts expressed by Sri Sastri on certain life accounts of Sri Sripadaraja and Sri Vyasaraya. In the book “Report on the Inscriptions of Devasthanams Collection with Illustrations”, Sri Sastri writes that Krishnadeva Raya granted couple of house plots to Sri Vyasatirtha through a grant dated 12/01/1524 AD. Sri Sastri also states that these house plots were previously confiscated from a Shrivaishnavite priest named Nambi Sirrappayan by Saluva Vira Narasimha Raya (c.1485-1491), the founder of Saluva dynasty of Vijayanagara. In my previous article about Sri Sripadaraja, I have mentioned these inscriptions of Krishnaraya and have tried to reason out the historical accuracy of an incident narrated in Sri Sripadarajashtaka. To my delight, I have found a doubt raised by Sri Sadhu Subrahmanaya Sastri (SSS) as early as 1930 that Sripadarajshtaka’s accuracy is doubtful. SSS says that there is a confusion in identifying the Vira Narasimha Raya mentioned in the said Sripadarajashtaka. He was of the opinion that the Narasimha Raya cited in the Ashtaka could not be Saluva Narasimha Raya whose name was mentioned in Krishnaraya’s grant to Sri Vyasaraja Tirtha. SSS, in the last lines of the above excerpt says //Probably there is a confusion here of the events of Sripadaraja’s life as depicted in “Sripadarajashtaka”// and also raises doubts about Sri Vyasaraja’s stay for 12 years at Tirumala. SSS suggests that Vyasatirtha might have lived at Tirumala during Krishnadevaraya’s regime and not during Saluva Narasimha Raya’s reign as suggested by Sri B. Venkoba Rao in his introduction to Vyasayogi Charitam. Further to the above doubts, SSS says that the “untoward incidents” that have caused Vyasaraja to stay at Tirumala for 12 years is doubtful and the land confiscation by Saluva Narasimha can’t amount such a sacrilege of Shrivaishnavites as depicted in Vyasayogi Charitam. In other words, SSS downplays the incident of Nambi Sirrappayan’s theft of temple jewels and the subsequent relinquishment of the priest’s lands by Saluva Narasimha. But in my opinion, this incident needs to be investigated from many angles, particularly from the angle of Rajadharma followed by the then Vijayanagara emperors. This incident cannot be downplayed as a petty incident and should never be dismissed as ‘unimportant’ by basing the judgment on an individual perception! Let me explain my argument with the evidences gathered. 1) It is a well known fact that the kings and emperors of Vijayanagara Empire have strived to uphold Sanatana Dharma in its core essence i.e. by adopting Varna system, embracing the Rajadharma preached in sacred scriptures, revering the Gurus of various belief systems and patronizing the temples and other places of worship. I have tried to provide a glimpse of “Dharmik Continuum” of Vijayanagara Empire, a rare feature that could be found in any Empire that flourished in India. 2) The confiscation of lands from a temple priest is not an ignorable act but an important matter to be pursued through the lenses of Dharma Shastra. The incident of Nambi Sirrappayyan shows the direct involvement of Saluva Narasimha Raya i.e. the Emperor himself and not any other officer from lower ranks. Thus the case of Nambi Sirrappayyan is of a special interest to the Emperor himself and his personal involvement and the subsequent judgment given by him clearly explains the quantum of crime committed. In other words, the crime committed is much condemnable than mere robbery of temple jewels. Also, I do not think that Nambi Sirrappayyan could have been the lonely culprit who committed such crime but there could have some more priests and temple managers involved in similar or various misdeeds. 3) By finding a place for his name in Krishnaraya’s grant to Vyasaritha, Nambi Sirrappayyan has become a mere reference to the various misdeeds assumingly committed by several priests of Tirumala temple and all these larcenies have occurred during the reign of Saluva Narasimha Raya. 4) The critical examination of the punishment meted to Nambi Sirrappayyan yields a strange but a striking anti-thesis of the then Rajadharma adopted by the successors to Vijayanagara throne. In those days, the kings and emperors of Vedic tradition were considering the confiscation of lands belonging to Brahmans as a great sin. Even the own showings of Vijayanagara emperors confirm that all the rulers were holding great reverence towards the lands donated to or held by the Brahmans. 5) Following verses which can be generally seen in almost all the inscriptions of Vijayanagara confirm the above statement. If one donates a [piece of] land it is like daughter and if the donation is made by father [or elders] then it is like sister and the land donated by others is like a mother and so forego the lands thus donated. For the kings (bhubhujam) there is only one sister in this whole [world] and that is the land donated to Vipras [Brahmans] and so never enjoy or grab the lands donated to Brahmans. In the case of Nambi Sirrappayan, it appears that Saluva Narasimha has gone against the aforesaid established policy of Vijayanagara Empire. In contrary to the prevailing Rajadharma, Saluva Narasimha had confiscated the lands belonging to Nambi Sirrappayyan who was not an ordinary Brahman but a priest at revered Tirumala temple. Thus the judgment given by the Dharma-abiding Vijayanagara emperor shall not be underplayed but must be understood its contents in true letter and spirit. Hence the said taking away of a Brahmin’s lands by an emperor confirms the quantum of misdeed done by the priest cited in Krishndevaraya’s grant to Sri Vyasatirtha. 6) As the crime(s) of Shrivaishnavite priest(s) have been condemned by the emperor himself, there should have been some alternative measures undertaken by the administration to hand over the temple management to a trustworthy person for some time. Thus the 12 years period of Sri Vyasaraya Tirtha’s stay at Tirumala gets confirmed beyond any doubt. In my opinion, history can be found not only in the lines written on an edict but also to be seen by reading in between the lines of those edicts. It is beyond anyone’s doubt that there were not just one but many ‘untoward incidents’ at Tirumala which have not been recorded by the then administration out of reverence for the priesthood but whose glimpse can be found in Krishnadevaraya’s inscription issued in the name of Sri Vyasatirtha. Further analysis of this Nambi Sirrayyappan’s incident, Vira Narasimha’s confiscation and Krishnadeva Raya’s grant to Sri Vyasatirtha will be presented in the next installment of this series. The story that srivaishnava priests of thirupathi at that time mis used their position and enjoyed the gods property and salva Narasimha had punished them by removing entire group from performing the pooja rituals at tirupati . A very good analysis Raghu garu. It is His decision that you should bring out these facts now. Please carry on. The wrongly published History gets corrected by this kind of articles.